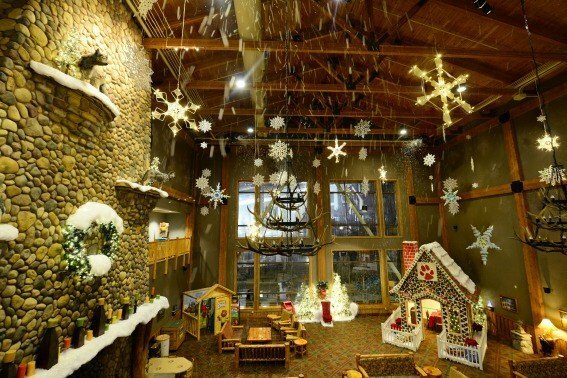 What’s in store for the Christmas and winter holidays at Great Wolf Lodge. Snow falling in the lobby? Sleeping in a cozy Wolf Den with a lit up Christmas tree? Trick or treating in a hotel? Splashing at an indoor water park? 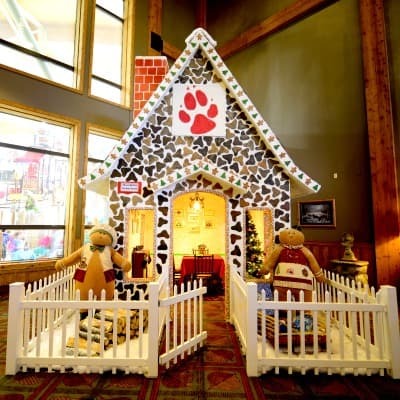 If your kids say – oh yes, please – then make plans to visit a Great Wolf Lodge this holiday season for loads of fun. My kids eyes opened as big as saucers as they gazed up at the giant balloon spider dancing on the ceiling of the great lobby of the Great Wolf Lodge, Garden Grove. How huge, creepy, and fantastic it looked! After spending the day splashing in the wave pool and racing down water slides, they eagerly changed into their costumes for the evening festivities. Harry Potter and Princess Lea joined the various Spidermen, flapper girls, and jesters to start the Trick or Treat Trail. Seven not-so-scary treat stations were situated around the main lobby and floor below, and after picking up a Halloween bag at the Haunted House in the lobby, we cruised around and gathered candy. A child’s dream come true. 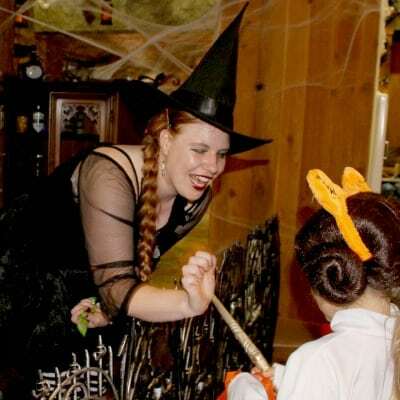 Kids can wear jammies or costumes for a spooktacular story time and then join in a costume parade. Stay up and howl with new friends at the Monster Mash Dance Party taking place select days and weekends. 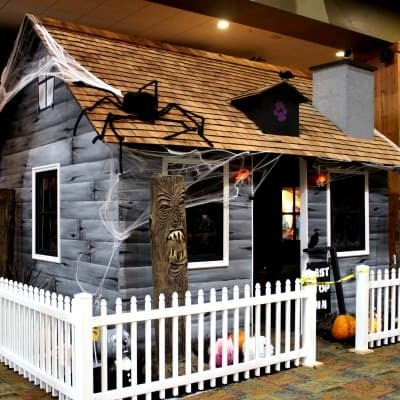 Go on a “Haunted Hustle” scavenger hunt and earn a prize or join the daily spooktacular story time. Bring your costumes with you to your next GWL stay and be prepared for Howl-O-Ween fun! Cool fact: Great Wolf Lodge supports their food allergy friends by hosting a Teal Pumpkin Project stop – a non food treat! Details: Start the Trick or Treat trail at the Haunted House in the main lobby anytime between 5 – 8 pm on weekends and 5 – 7 pm on weekdays. Pick up a map to identify where the different stations are – and ask directions if you can’t find the tricky “Stairwell 1” and “Stairwell 2.” Halloween festivities run during the month of October. Please note that different GWLs across the country may have different schedules, so check first. Share your photos at #GWLHowloween. Costumes are encouraged but not required for all events. Santa is coming to the Great Wolf Lodge! He’s bringing with him a sleigh loaded with Snowland fun for all the kids and Forest Friends of GWL. 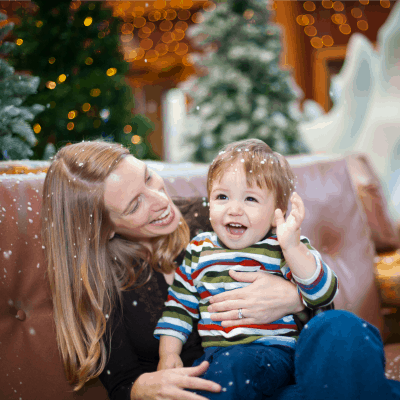 Starting the Saturday after Thanksgiving, big festivities will take place in the winter wonderland lobby along with winter howl-i-days story times, dance parties, and special events. Kids will thrill to experience the nightly snowfall – one that melts gently without freezing! A life-size gingerbread house graces the lobby made with beautiful decorations, but this one is unique – you can eat breakfast, lunch, or dinner inside it! Reservation costs go to support Ronald McDonald House Charities so make your reservation for your local GWL today. You can dine without being an overnight guest at GWL. 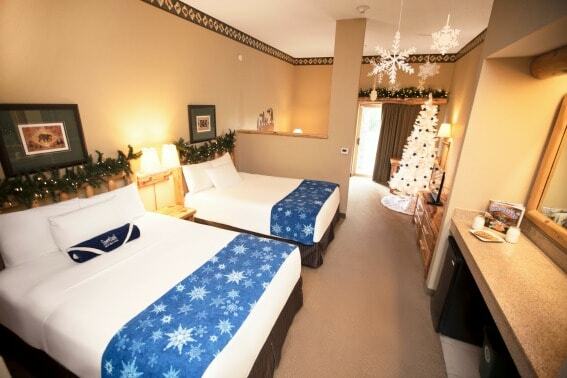 Special rooms are decorated for the howl-i-days to bring extra joy into your room. Twinkling lights, festive garlands over the bed, and a fully decorated holiday tree in the corner make it a magical snow land. Cookies and milk are delivered to your room by a Great Wolf character. Rooms start with a $50 premium and are available for booking now. 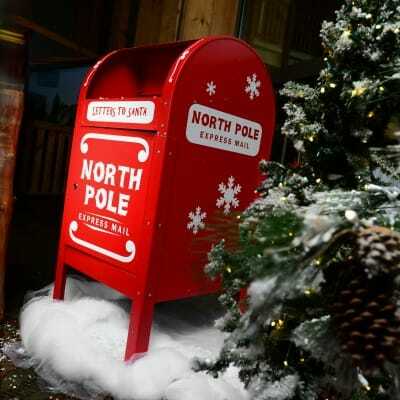 Send a letter to the North Pole and, surprise, you may hear from the Chief Elf himself! Story time takes on the joy of the season for the Forest Friends with special visits from Santa Claus. Take a photo with Santa Claus to never forget your special visit to the GWL for Christmas. Celebrate the eve of a new year – New York style! A special ball will drop early for little wolves to hit their dens before midnight without missing any of the fun. Dance parties, balloon drops, bounce houses, magicians, and so much more will make this party an epic celebration of the new year. Great Wolf Lodge is the place to be! Details: Snowland takes place the Saturday after Thanksgiving until January 1 but check your local GWL for specific dates and events. Share your holiday photos at #GWLHowlidays. 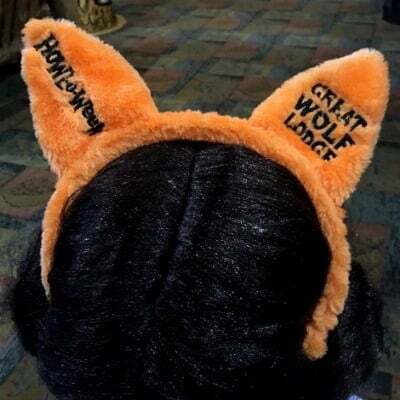 Disclosure: My family and I were hosted at the Great Wolf Lodge, Garden Grove, to experience the activities of Howl-O-Ween and to get a preview of Snowland. All opinions are my own.